INDIANAPOLIS (April 11, 2019) – GreenLight Collectibles is excited to announce their collaboration with The Busted Knuckle Garage, an automotive gift company specializing in garage gear, furniture, clothing, and collectibles. The Busted Knuckle Garage lifestyle brand was coined back in 1996 by founder and president, Warren Tracy. At the time, Tracy was working as a manager of Phantom Ranch at the bottom of the Grand Canyon when he woke up one night with a vision of the injured hand holding a wrench. He quickly sketched it down before going back to sleep, and the rest is history. After quitting the ranch, Tracy’s entrepreneurial drive turned his dream brand into a reality. There are over 250 different items for sale to date, and The Busted Knuckle Garage is sold through their online store (www.bustedknucklegarage.com), automotive catalogs, national chain stores, and their brick-and-mortar store in Prescott, Arizona. Warren Tracy was happy to get out from under the hood and express his excitement about the new Busted Knuckle Garage collectibles being produced under license by GreenLight. “Still having most of my own collectibles from the mid ‘60’s, I’m delighted to know that anyone who’s busted a knuckle wrenching on their favorite vehicle will now be able to celebrate mechanical mayhem with a desktop memory of their own. The quality, workmanship and detail of these new models are just simply world’s apart from what was made in the old days. The appeal to both young and old looks to be without limits,” said Tracy. 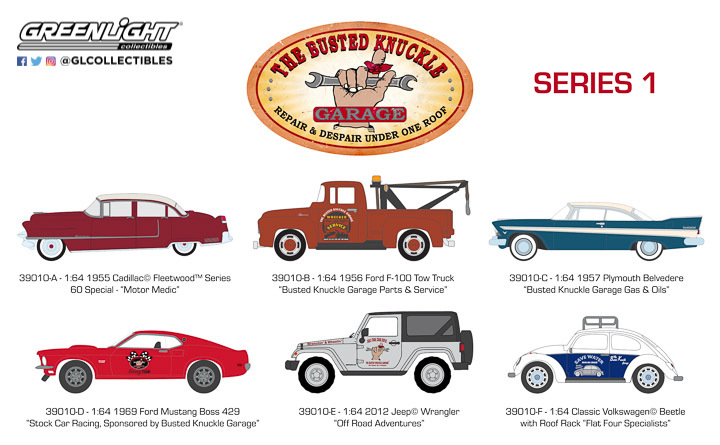 To learn more about the Busted Knuckle Garage, visit their Facebook and Instagram. To learn more about GreenLight Collectibles, visit their website, Facebook, Instagram, and Twitter. GreenLight Collectibles is a premier manufacturer and marketer of authentic die-cast vehicle replicas, scale figures and other automotive-related products. GreenLight replicas are produced under various themes in 1:18, 1:24, 1:43 and 1:64 scales and are officially licensed by the world’s premier automotive and entertainment companies, including: General Motors, Ford Motor Company, Fiat Chrysler Automobiles, Volkswagen AG, Nissan North America, Airstream, Fleetwood, Goodyear, Bridgestone Brands LLC, Michelin Tires, BF Goodrich Tires, Sumitomo Rubber Industries, Ltd., Winnebago Industries, NYC & Co., California Highway Patrol, ABC Television Network, Warner Brothers, Carroll Shelby, Paramount Studios, Sony Pictures, Sony Television, Lionsgate, AMC, NBC/Universal, CBS, Stephen J. Cannell Productions, Twentieth Century Fox, Terminator, Eleanor Licensing LLC, United States Postal Service, United Parcel Service, Elvis Presley Enterprises, The Steve McQueen Foundation, Gone in 60 Seconds, Eleanor Licensing LLC, Gulf Oil, Gulf Oil International, Ltd., Pennzoil, Bardahl, Turtle Wax, Marvel Mystery Oil, Chevron/Texaco, STP Oil, PURE Oil & Firebird Racing Gasoline, Gold Eagle Co., Graveyard Carz, BIGFOOT 4x4, Inc., Mecum Auctions, Barrett-Jackson, Brock Racing Enterprises, and the NTT IndyCar Series.